Peter Parker has to deal with the return of the discarded alien symbiote when it takes a new host in the latest Marvel’s Spider-Man. Venom is such a popular character that he’s bound to eventually appear in pretty much any Spider-Man adaptation. There are obviously exceptions to this but most modern takes on the character have the black suit story play out at some point. Entire articles could be written on what makes Venom so popular and that’s something I might do someday but for now I’ll take it for granted that many fans of Spider-Man also like Venom so that’s why the character keeps turning up. The curious thing about Venom is that anyone can bond with the Symbiote as the alien life form is what imbues its host with the necessary abilities. Eddie Brock is the most well known and arguably the most popular human part of the equation but that relies on the character being part of the narrative in some way. 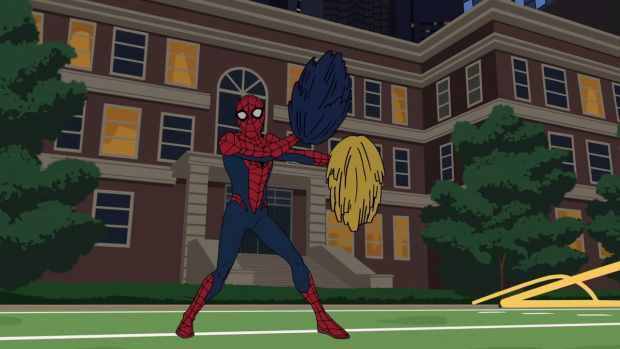 This version of Spider-Man currently doesn’t have the Eddie Brock character so part of the plot of this episode is a mystery around who the symbiote has taken as its host. Tony Stark is Peter’s immediate assumption but the episode itself casts suspicion on Max Modell who behaves somewhat oddly throughout. He refuses to let Peter put away the container that used to house the V-252 and is exhausted the day after Peter first encounters Venom. Peter may not be immediately suspicious but the signs are there for the audience to pick up on. For me, Max Modell was the least likely option as the episode goes out if its way to make him the obvious choice. 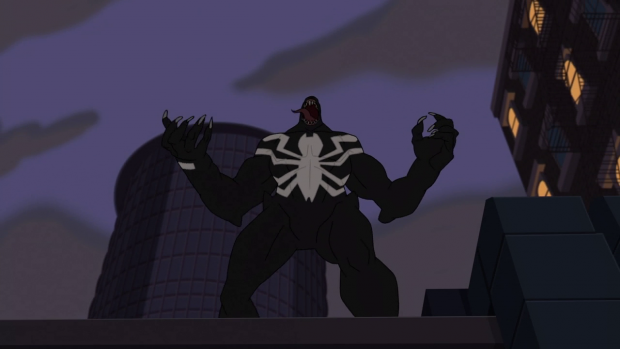 Even Venom’s design makes Max a likely suspect as he looks roughly the same size Max is. Usually on TV the most obvious choice is a red herring so I was always sceptical that Max would prove to be the answer. I can see how the red herring might be a shock to younger audiences not used to it and it wasn’t done particularly badly. The emergence of Venom isn’t really the point of the episode as the focus is more on establishing some common ground between Peter Parker and his former school bully Flash Thompson. Peter has agreed to tutor Flash despite Flash’s earlier treatment of him. As Max points out it shows Peter’s strength of character being willing to help someone who treated him so badly. Peter mentions that Flash asked for his help and he’s unable to turn down someone who recognises that he has a problem and actively tries to solve it. Since Flash Thompson was Venom in the comics he was top of my list of suspects and the episode actually does a really good job of dropping more subtle clues. The focus is on Max Modell as a suspect but the clues are there for Flash such as his really aggressive rivalry with the other quarterback. He makes threats that might be innocuous enough but they actually point towards Flash being Venom when the quarterback is rendered unable to play as a result of a Venom attack. The bond between Peter and Flash in both of his identities is handled well. Flash is shown to be grateful for Peter’s help and slowly warming up to him. At first he gives him a hard time for the sake of appearances and changes that completely by the end of the episode once he realises the value that Peter’s teaching is bringing to his life. The more meaningful interaction they have is when Flash is freed from the influence of the Symbiote and they work together to help the infected. Working with Flash as Spider-Man allows Peter to see Flash for who he is outside of someone that persistently bullies him. His reasons for bullying Peter are never explored but it looks like that’s something they have moved past at this point. Flash definitely grows as a person as a result of the events of this episode. Peter teaches him to defeat his quarterback rival by showing that he’s a superior player rather than violent means. The Venom Symbiote unknowingly causes Flash to violently react to him but on an intellectual level Flash realises that Peter is right and chooses to let his skill do the talking. I like that the show is developing Flash as a complex character and setting up Peter’s personal life as something he doesn’t have to worry too much about. Part of the charm of Spider-Man is that he has normal problems that he juggles with being a superhero but being bullied can only really go so far so I’m interested to see what other problems will arise for him as a person. This episode boasted some really creative action sequences. The stadium setting was visually impressive and Peter rattling off every football term he knows before quickly running out of them was amusing. The way he takes charge of the situation and works out a strategy shows how much he’s growing as a hero and not letting his guilt over the loss of Uncle Ben weigh him down. This is a version of Spider-Man who recognises when he can’t defeat a villain on his own and doesn’t feel guilty about putting others at risk when they consent to do so. This leaves this version more open to easy team-ups and reduces his self imposed sense of responsibility. As long as this is compensated for in other ways it’ll be fine but for now I applaud the writers for attempting to take this version of the character in another direction. There are a handful of fun asides in this episode such as the introduction of Mary Jane Watson who is dressed head to toe in a tiger costume allowing Peter to say her “Go get ’em Tiger” catchphrase. There’s very little to this other than it being a fun way to reference the extended period of time between her being first mentioned and first introduced in the comics. It was clearly a reference but felt fresh at the same time. A subplot involving Peter’s teacher resenting Maxwell Lord for taking all his best students from Midtown doesn’t quite lad as it’s mentioned once and resolved definitively by the end of the episode. For this to work it would have to be something that had been previously established but this particular show is busy enough so the subplot could have just been left aside and the episode would have been better for it. A great episode that enhances Peter’s relationship with Flash Thompson while also showing how much growth Flash is capable of as a character. The way he slowly starts to value Peter’s help and shows his worth to Spider-Man is very well handled and I liked the subtle clues to him being the man behind Venom. 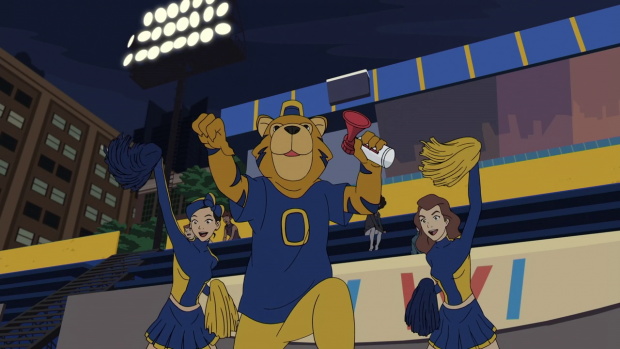 The episode was obviously trying to point the audience in the direction of Max which was a little too on the nose as a red herring but I can see how it would work on younger audiences. The episode also boasts some really creative action that has plenty of Peter’s personality coming through and shows how he has grown as a hero. The only real misstep the episode takes is an unnecessary subplot involving a Midtown High teacher resenting Max Modell for taking all his best students. It’s really thin and is resolved by the end of the episode therefore rendering it pointless.